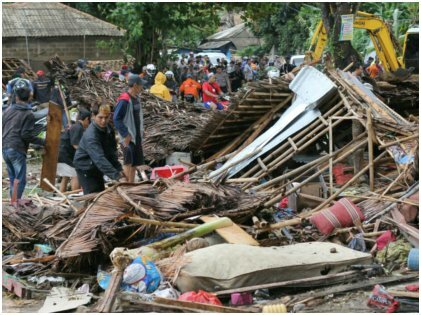 Hundreds of people were killed and thousands were injured and rendered homeless as a deadly tsunami caused by a huge chunk of Indonesia’s Anak Krakatau volcano slid into the ocean in December 2018. As per the latest updates, more than 370 people were killed, and many properties were destroyed and submerged along Indonesia’s Sunda Strait. 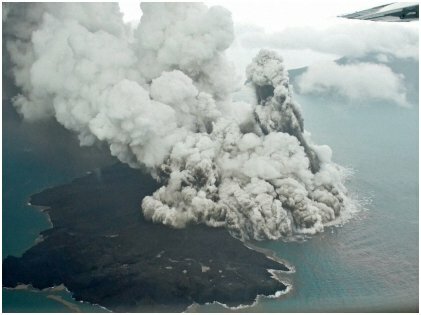 Indonesian officials confirmed that the volcano, Anak Krakatau, had been churning out lava and ash for the last few months, and on December 22, 2018, a section of the volcano’s south-west fraction collapsed and slipped into the ocean which caused a massive underwater landslide that culminated into a tsunami. European Space Agency’s satellite Sentinel-1 captured a few aerial visuals that showed a massive portion of the south-west flank of Anak Krakatau slipping into the ocean right before the disaster happened. As the tsunami was caused by a volcanic eruption and not an earthquake, the quake warning system totally failed. Coastal residents who managed to survive through it reported that they didn’t see it coming, and there was no official warning whatsoever. 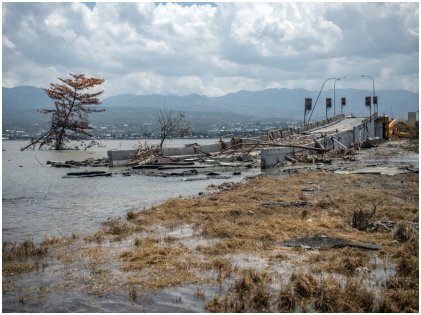 Indonesia’s disaster management system was literally caught off guard when the giant tsunami hit the Sunda Strait region. The country’s military personnel and the rescue volunteers were seen spending hours scouring the beaches for possible survivors shortly after the giant waves receded. Reports from the ground suggest that close to 1,500 people were heavily injured, and more than 500 homes, 420 vessels, and about 60 shops were either completely destroyed or damaged when the catastrophic tsunami hit the region. The death toll continues to rise, and the total number of missing people cannot be confirmed at this moment. Horrifying footage also shows that a local pop band, Seventeen, was swept away by the giant waves during a live performance. People who were enjoying the show at that time also went missing. The onus is now on the rescue and aid teams to find out the missing people first and to evacuate trapped people to safer zones. Sutopo Purwo Nugroho, a spokesperson for the disaster agency of the country, later announced on Twitter that they had no warning system in place for volcanic eruptions and landslides, and the existing system is only for monitoring earthquake activities. He also mentioned that the country must have its own warning system for tsunamis that are triggered by volcanic eruptions and underwater landslides. Landslides also caused the Maumere Tsunami in 1992, and more recently, the Palu Tsunami which occurred in September 2018. The authorities have warned people to stay away from the beach, and locals are strongly advised against carrying out activities along the coastline. Teresa Ubide, a prominent volcanologist, told The Guardian that the volcano had been spewing lava for the past couple of months and even suggested that the volcano is still active and may erupt again. Due to the proximity of the volcano to the coastline, people had not been warned on time. She also added that volcanic eruptions cannot be forecast as there are almost no seismic activities that can be analyzed by geophysicists and disaster prevention officials. Richard Teeuw, an earth scientist, said that further tsunamis are highly likely to happen as the volcano is still very much active, and it may cause further underwater landslides. Both national disaster management agencies and international rescue teams are at work to restore normalcy in the region. 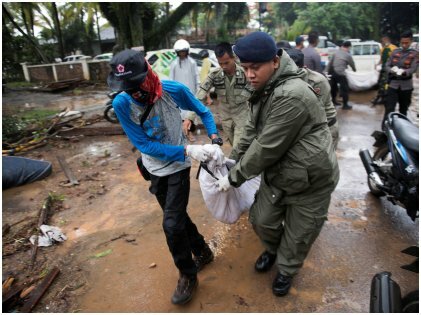 As per latest reports, rescue and aid workers were busy helping injured people evacuate, bringing in potable water and waterproof canvasses, and providing shelter to the homeless. Authorities are also getting prepared for a possible outbreak of waterborne diseases. Life in and around the tsunami-affected region has surely come to a standstill. Many of the tsunami-hit areas along the coastlines were popular places for vacationers. While locals were among the worst hit, foreigners were also badly affected by the wrath of the tsunami. One of them, a volcano enthusiast from Norway, later posted on social media that he literally had to run away as fast as he could when the waves hit the beach. The tsunami was not very large, but it was destructive. Popular beach towns have turned into ghost towns since the deadly tsunami hit the region. The entire world is now praying for Indonesia. Surely, the Southeast Asian country needs some time to build up its strength again, and we can only hope that the victims will recover from this horrendous ordeal.